Chemistry is the study of the material world. What are different materials made of? How is their composition and structure related to their properties? How does one material become transformed into another? These are the sorts of questions that have driven the development of chemistry. People have been using chemistry for a very long time. Medicines were obtained from plants in early societies all over the world. People made dyes for clothing and paints for houses. Metallurgy was practised in India and the Sahel, in Africa, before 1000 BC. The Greek philosopher, Democritus, is often cited as the earliest person to formulate an idea of atoms, although similar ideas were recorded in India around the same time. Democritus thought that all things were made of atoms. Atoms were very small, he thought. They were also indivisible. Although you could cut a piece of wood in half, and cut each of those pieces in half, at some point you would reach the stage at which the wood could not be cut any longer, because you had a slice that was one atom thick. There were an infinite variety of atoms, Democritus thought, making up an infinite variety of materials in the world. The properties of those atoms were directly responsible for the properties of materials. Water was made of water atoms, and water atoms were slippery. Iron was made of iron atoms, and iron atoms were strong and hard. We don't quite think of materials in the same way today, but we have retained some of the roots of these ideas. For example, we do know that matter is composed of atoms, and that there are different kinds of atoms that make different materials. However, we also know that those atoms can combine with each other in different ways to make lots of different materials. All of the materials in the world around us are made from atoms. A more practical aspect of chemistry has its roots in the Islamic Golden Age. Practitioners such as Jabir Ibn Hayyan developed laboratory apparatus and experimental methods to recrystallize and distill compounds from natural sources. Like Democritus, these early chemists wanted to know what the world is made of, but they were also trying to make improvements in practical applications such as tanning leather, making glass or rust-proofing iron. Natural products are widely used in food, medicine and industrial applications. See if you can match the following natural products to their original, natural source. The translation of Arabic texts into Latin helped spur the European Renaissance. Practical observations from the Islamic period, such as the fact that matter could be converted into different forms but did not disappear, gave rise to some of the most fundamental ideas of modern chemistry. Conservation of mass: matter can be converted from one form to another, but it does not disappear. As is usually true in science, new developments in chemistry built on earlier work as well as the work of contemporary colleagues, continually improving our understanding of nature in small steps. In the 1600's, Robert Boyle adopted the Islamic emphasis on experimental work. Among his experiments, he was able to isolate the hydrogen gas formed by reacting metals with acids, as other scientists were doing at that time. In the 1700's, Joseph Priestley isolated several different "airs" or gases, including oxygen. Henry Cavendish showed that hydrogen combined with oxygen to form water. Antoine Lavoisier argued that oxygen and nitrogen, the other major component of air, are elements -- materials that cannot be made from any other kind of atom. In contrast, water was not an element, because it could be made by combining atoms of oxygen and hydrogen. The free exchange of ideas allowed people to rapidly advance our understanding of the material world. Lavoisier, in particular, was important in bringing a number of important ideas together. He clearly stated that elements were the basic unit of matter, that could not be obtained from other materials. Compounds were made by combining different elements. His careful use of a balance to weigh reactants and products of an experiment clearly confirmed the idea of conservation of mass: the total mass of products after a reaction equals the total mass of reactants. These conclusions were more sophisticated versions of earlier ideas, and Lavoisier was able to present them in a way that eventually gained wide acceptance. A compound is a mixture of different elements bonded together. Conservation of mass, revised: the total mass of products after a reaction equals the total mass of reactants. In the 1800's one of the principle proponents of the developing atomic theory was John Dalton. He advanced the idea that all atoms of a particular element are identical (as far as he could tell at that time). An element is a fundamental atomic building block from which other materials are made. Dalton performed analyses to try to deduce the atomic weights of different elements. Taking these ideas together, he showed that a particular compound always contained the same elements in the same ratio. An element is a fundamental atomic building block from which other materials are made. A compound is a mixture of different elements bonded together in a specific ratio. A compound may have a specific number of atoms of one type combined with a specific number of atoms of another type. Because all atoms have weight, we can also think of a compound as a specific weight of one kind of element combined with a specific weight of another element. For example, water is a compound made from hydrogen and oxygen. It is crucial for life, of course. Water is about 1/9th hydrogen by weight; the other 8/9ths are oxygen. However, a different compound, hydrogen peroxide, is a rocket fuel. Hydrogen peroxide is only about 1/19th hydrogen by weight. Those specific ratios of hydrogen to oxygen are inherent qualities of each compound. Furthermore, Dalton found that he could make compounds through different methods. For example, he could make cupric oxide (CuO) by heating copper in air, or he could make it through various reactions involving copper and acids. It didn't matter how he made the cupric oxide; the ratio of copper to oxygen was always the same in the product. There is one other compound containing copper and oxygen in a different ratio; it is called cuprous oxide, and it has the formula Cu2O. However, it is very different from cupric oxide. The most obvious difference is that cuprous oxide is red whereas cupric oxide is black. Once again, when elements are combined in different ratios, different materials are produced, and they have properties that differ from each other and from they elements of which they are comprised. Ratios are commonly used in baking. Usually, ingredients must be combined in the correct proportions in order to make brownies or a cake. a) Brownies and cake have a lot of ingredients in common. Looking at those ingredients that are found in both brownies and cake, do you see any difference in the proportions used? How do you think that affects the properties of the product? b) The above cake recipe is just for one shallow cake pan. If you wanted a two-layer cake, what would you do with the recipe? c) Suppose you are cleaning out your fridge and want to turn all of your eggs into brownies. If the above recipe makes sixteen 2" x 2" brownies, how many brownies could you make with a dozen eggs? How much flour would you need to accomplish your goal? 1 cup flour = 125 g; 1 cup sugar = 200 g; 1 cup cocoa = 90 g.
How many grams of flour, sugar and cocoa would you need to use for a batch of brownies? e) Why do you think a cup of flour doesn't weight the same as a cup of sugar or a cup of cocoa? 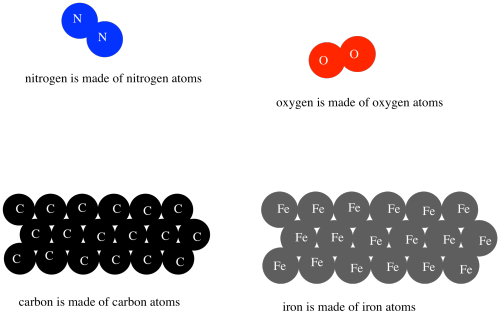 Mercury forms two different compounds with oxygen: mercuric oxide (HgO, which is red) and mercurous oxide (Hg2O, which is black). a) How many atoms of mercury combine with one atom of oxygen to form one unit of mercuric oxide, HgO? b) How many atoms of mercury combine with one atom of oxygen to form one unit of mercurous oxide, Hg2O? c) Given the following approximate atomic weights, what is the total weight of one unit of mercuric oxide? d) What is the weight of one unit of mercurous oxide? It's pretty difficult to weigh an individual atom. Because we are working with ratios, we can always scale up and keep the ratio of atoms the same, and we will just make more of the compound we want. Instead of weighing things in atomic mass units, we usually weigh them in grams. 200 amu of Hg plus 16 amu of O makes 216 amu of HgO, which is just on unit of HgO. An atom of mercury weighs 200 amu and an atom of oxygen weighs 16 amu, so one atom of mercury combined with one atom of oxygen weighs 216 amu. A mole of mercury weighs 200 g. A mole of oxygen atoms weighs 16 g. A mole is just a scaled-up batch of atoms; it is just the atomic mass number of the atom, but weighed in grams instead of amu. a) How much does a mole of HgO weigh? b) How many grams of mercury would be needed in order to make one mole of Hg2O? c) How many grams of mercury would be needed to make 0.25 moles of HgO? d) How many grams of oxygen would be needed to make 2.08 g Hg2O? Priestley isolated oxygen by heating up mercuric oxide. How much oxygen could be made by heating 1 g of HgO? By the late 1800's, enough different elements had been isolated that people began to notice patterns in their properties. If you listed the elements out by weight, elements with similar properties seemed to occur at regular intervals throughout the list. A Russian chemistry teacher, Dmitri Mendeleev, came up with a convincing way to convey this "periodicity" in a table. This is the modern periodic table (an example is shown in figure AT1.1). Figure AT1.1. The periodic table. Download a copy of the periodic table. The noble gases are an example of one of the groups in the periodic table. They have a number of properties in common. As the name suggests, all of the noble gases exist in the vapour phase at normal room temperature. They are all pretty unreactive; they do not undergo chemical changes very easily. In terms of structure, they each exist as individual atoms in nature. The rest of the elements in the periodic table don't really exist as individual atoms in nature. In one way or another, they cluster together with other atoms. They may bunch up with other atoms of the same kind, forming an element, or else form groups with atoms of different kinds, forming compounds. Noble gases rarely do either of those things. Because of their similar qualities, Mendeleev put the noble gases together in one column in the periodic table. They are helium, neon, argon, krypton, xenon, and radon. a) Which of the following elements are in the same group as oxygen: silicon, sulfur, or neon? b) Which of the following elements would have similar properties to carbon: silicon, nitrogen, sodium? c) Which of the following elements would have similar properties to magnesium: calcium, lithium, potassium? d) Which of the following elements would have similar properties to sodium: nitrogen, potassium, lithium? e) Which of the following elements would have similar properties to nitrogen: oxygen, phosphorus,rubidium? f) Which of the following elements are in the same group as fluorine: argon, iodine, or neon? g) Which of the following elements are in the same group as gold: silver, copper, zinc? h) Which of the following elements are in the same group as iron: ruthenium, copper, gold? In a similar way, chemists began thinking about other columns in the periodic table as belonging in groups. Sometimes, these groups were given specific names, like the noble gases. There are the halogens, meaning "salt-makers", because they were often contained in salts. There are the chalcogens, "ore-makers", found in iron oxides such as haematite and taconite, for example. There are the pnictogens, "choke-makers", so called after the discovery that air is mostly composed of nitrogen, but nitrogen is not the part of air that we breathe. Other groups are simply referred to as the self-explanatory "carbon group" or "boron group" after the first element in the column. Alternatively, the columns of the periodic table are often numbered. 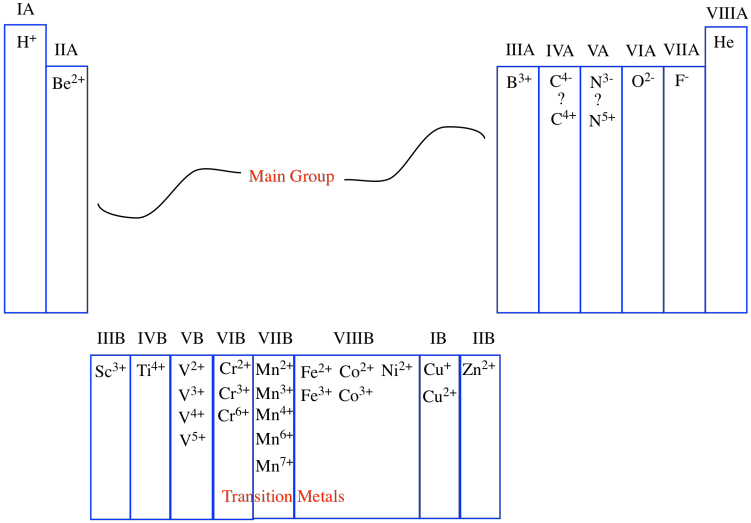 At one time, the columns were separated into different groups, with specific focus on two of them: the main group and the transition metals. 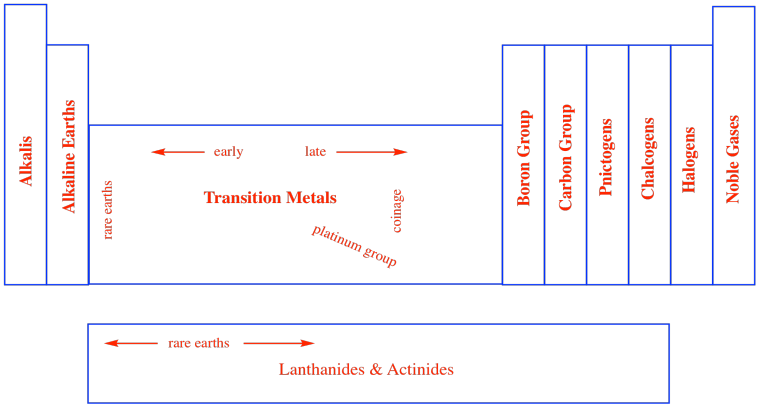 The main group was Group A and the transition metals constituted Group B. Each successive column across these blocks of the periodic table was then numbered using Roman numerals. One of those periodic properties that is found in each column is the usual charge on an ion. Atoms sometimes capture extra electrons, which are negatively charged sub-atomic particles, becoming negatively charged overall. Other atoms sometimes lose their electrons, becoming positively charged as a result. To some extent, the column number corresponds to the charge on the common ions found in that column. For example, in the first column, the atoms are almost always found as ions with a +1 charge; in the second column, the atoms are almost always found as ions with a +2 charge, and so on. That correlation breaks down after a while. Sometimes, as in the transition metals, the group number simply denotes the highest possible charge on an ion, although there may be many possible ions that are commonly observed. Eventually, as we move to the right, the correlation between group number and charge breaks down altogether. In the main group, the atoms farther to the right are not cations at all, but anions. Some, such as carbon and nitrogen, can be formally thought of as either anions or cations, depending on their environment. In a sense, although we like to be organized and number things from left to right, the periodic table is naturally organized from the edges inward. Atoms closest to the left edge build up positive charge according to how far away from the edge they are. Atoms closest to the right edge build up negative charge according to how far away from the edge they are. Atoms in the middle vary a lot more, though. This edge-orientation is related to the stability of the noble gases and what are called "filled-shell configurations". We will get to those, and to the physical reasons for their stability, on a later page. So, the columns in the periodic table are designed to show us which elements are related to each other. What else is shown in the table? If we look at just one square of the periodic table, we can see what it tells us about an individual element. In the middle of the square, there is a Roman letter or a pair of Roman letters. The first letter is always a Roman capital. This one- or two-letter designation is the atomic symbol. It is usually the first couple of letters in the name of the atom, although the name isn't always in English. For example, the symbol for mercury is Hg, for hydrargyrum. That's the Latin name, meaning, roughly, "liquid silver". Above the symbol, or sometimes above and to the left, is the atomic weight of the atom. The atomic mass is one of the properties of an element, but it turns out that a given element can have a range of atomic weights. Consequently, the average weight is shown in the periodic table. For example, the smallest atom, hydrogen, can have a weight of either 1, 2, or 3 atomic mass units (or amu). The average weight of a hydrogen atom is 1.008 amu. That fact tells us that most of the hydrogen atoms out there have a weight of 1 amu; relatively few of them have atomic weights of 2 amu or 3 amu. Most of the mass of an atom comes from the nucleus of the atom, where relatively heavy particles, the protons and neutrons, are found. Hydrogen atoms always contain a proton, with a mass of 1 amu, but they can also contain varying numbers of neutrons, which also have a mass of 1 amu. The number to the lower left is called the atomic number. Notice that each element in the periodic table has a number assigned from 1 to 112. The elements are numbered in order from "smallest" to "largest", roughly speaking. Element 1, hydrogen, is the smallest, and element 112, copernium, is the largest (at least, that's as far as the teams of chemists and physicists who look for new elements have gotten so far). More correctly, the atomic number simply tells us the number of protons in the nucleus of an atom of a given element. Hydrogen always has one proton; copernium always has 112 of them. Finally, the name of the element may or may not be written on the periodic table. The other three pieces of information are always there. Sometimes additional information is given, such as specific properties of the element. Supply the following information about each element. a) The atomic number of calcium. b) The atomic symbol of sodium. c) The atomic mass of oxygen. d) The name of P.
e) The name of element 6.
f) The symbol of tin. g) The atomic mass of sulfur. h) The name of K.
The periodic table as laid out by Mendeleev had predictive value. It presented the structure-property relationships of atoms. If you knew something about one element in the table, it would lead you to believe that other elements in the same column would have similar properties. Furthermore, there were gaps in the table where there ought to be an element, but none was known. It was predicted that these elements would eventually be discovered, and they were. However, people were not satisfied with the idea of the atom as the basic building block of the universe. People wanted to know how atoms themselves were made. Ultimately, answering this question depended on the development of quantum mechanics. We will learn a little bit more about that view of the atom next. What is the approximate weight, to the nearest g, of a mol of each of the following elements? What is the weight, to the nearest gram, of a mol of each of the following compounds? h) acetic acid, CH3CO2H, which is dissolved in water to make vinegar.